Japanese desktop PC owners can now try out all the ExpressCard 54 devices still unvailable to many notebook owners, courtesy of local firm Kuroutoshikou. 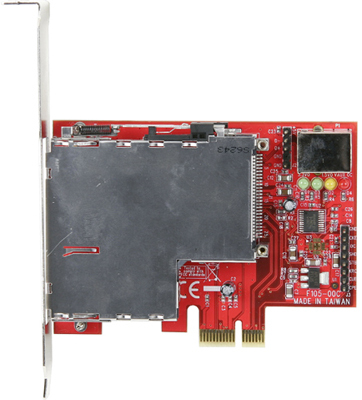 Its Excard-LPCIE is a low-profile PCI Express x1 add-in board with an ExpressCard 54 slot. There's a USB 2.0 port on board for good measure. The PCMCIA organisation reckons there are a whopping 21 ExpressCard 34 and 54 devices out there that are formally certified as compliant with the standard, at least that's how many its website lists. Most of them are memory card readers of one form or another, though we see there are a couple of TV tuners and cellular network modems on the list too. Only one of the 21 is Mac compatible.